This Mayan gluten-free power flour is such an amazing way to add a nutrient and taste boost to your favorite recipes and baked goods. 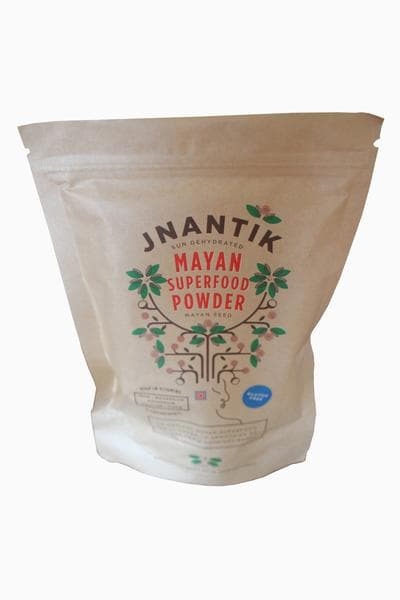 This Mayan gluten-free power flour is such an amazing way to add a nutrient and taste boost to your favorite recipes and baked goods. The Maya Nut is harvested from the Maya Tree that grows in Mexico and South and Central America. This particular blend was ecologically wild harvested by women from an indigenous Mayan community in the mountains of Jalisco, Mexico and roasted and ground with love. The ancient Mayans survived on this super food in times of famine. It can be used in anything from tortillas, cookies, breads, smoothies to ice cream! You also have a full and satisfied feeling after eating this that you do not get from regular grain flours. Try it out and feel for yourself! We suggest adding 1/2 cup to your baked goods. or we suggest substituting half of your flour with Jnantik. Traditionally the Mayan seed is added to breads and tortillas for a nutritional boost.